Yesterday morning I had the hankering for a bike ride. 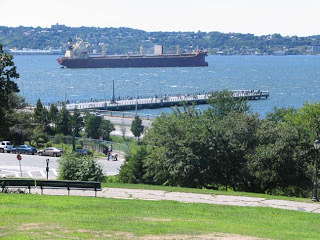 Knowing there were some decent bike routes to get to the Bay Ridge promenade that eventually runs beneath the Verazzano-Narrows, my boyfriend did a little research. One of the sites he consulted was Ride the City (see my earlier post about it). This is one of those times he utters, "if I only had an iPhone... ," because we don't have a printer to reproduce the route for our bike trip. Plus, all of our area maps are in the car (I love maps). So he just wrote down all of the critical turns to get where we needed. After eating a yummy farmer's market lunch, we hopped on our bikes and headed out. We rode through the park and overshot our first turn by about 1/4 mile, going out the due south end instead of the SSW end (near Windsor Terrace). But we figured it out and were back on track after about a mile detour. We rode through neighborhoods we had yet to see on bike: Kensington, Borough Park, Sunset Park. When we got to Sunset Park we went through the park whence the name came. There are some great views of the city from up there (you can see the Statue of Liberty in the middle right of this pic). From Sunset Park we rode down along 2nd avenue to 67th street, into Owl's Head Park, a cute little park with a bay view. In the image above you can also see the entrance to the promenade that runs along the New York Bay. We entered there and rode down to the Verazzano-Narrows Bridge. There's an exit from the promenade right by the bridge (where we're standing in the above image), so we said goodbye to the bay and headed up 4th avenue. 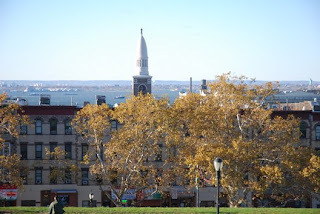 We stayed on 4th through Bay Ridge, then headed up 5th avenue back into Sunset Park. 5th ave in this part of Brooklyn is not the best place to bike (unless you're into chaos). It was madness. If I were blindfolded, spun around, drugged, put in the trunk of a car and brought to this part of Brooklyn, I would think I were in another country. Somewhere in Central America. On every block there were at least 2 double parked cars on each side of the street. Pedestrians bounced across the street like Frogger -- no fear, no discretion. Latino tunes blared from storefronts, cars, block parties. Eventually, the madness gave way to industrial serenity as we neared Greenwood Cemetery. Thankfully, the northbound traffic was detoured and we had the entire lane to ourselves. As we rode past the cemetery we heard some exotic chirping. Those are definitely not natives. They're the famous Brooklyn Parrots! They were thought to have been accidentally freed from their shipping crates at JFK in the late 1960s. 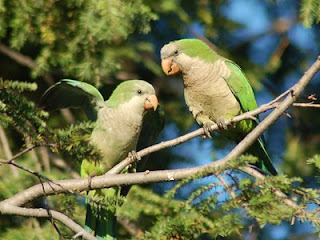 The parrots eventually proliferated and made their way to different parts of Brooklyn and other boroughs. The parrots blended in so well with the foliage, we had a hard time seeing them (and capturing them on camera). So we moved on, continuing down 5th ave and onto 16th street. We stopped at a coffee shop in Windsor Terrace for a snack and ended our adventure in Prospect Park (via the entrance we were supposed to start our ride from). The round trip was about 16 miles and much more entertaining than riding around the loop in the park 5 times. One of the best parts about biking in Brooklyn (or anywhere in the city for that matter) is the diversity -- the culture varies, the people vary, businesses vary to cater to the people of the area. In a matter of a few miles we were in Italy, China, the Middle East, Mexico. Every time the landscape would change I would think, "this too, is Brooklyn." Steps 3-12. Bring home your treasures, and get out the toaster. Slice the bread (if it's not already) and throw it in the toaster. Pick and wash the basil. Wash and slice the tomato. Take that bread out of the toaster. Slather on the goat cheese (don't be shy!). Place the tomato slices on top of the cheese. Sprinkle a little sea salt and fresh ground pepper on the tomato. Cover that layer with the basil leaves. 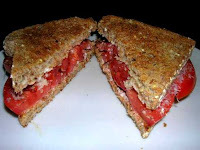 Pour a bit of EVOO and balsamic on the other slice of bread (be careful not to overdo it, unless you like a soggy sammy). Place that slice on top of the pile of goodness. Slice down the middle. Step 13. Eat it up, yum!